WHILE LABOUR’S PROBLEMS in dealing with anti-semitism have been well documented in the UK, similar issues have been creeping up for US Democrats. The issues haven’t caused the internal upheaval seen in Labour, but they represent a glimpse into a changing party that is fascinating in its complexity. The most high-profile incident led to an apology by Ilhan Omar who, along with Rashida Tlaib, are the first Muslim women elected to congress. Omar was forced to apologise when criticism she made about US politicians’ support of Israel was accused of promoting anti-semitic ideas. In a tweet a fortnight ago, Omar had said this support was “all about the Benjamins baby”. A reference to a hundred-dollar bill, in the style of Puff Daddy. The initial tweet was vague in exactly what she was pointing too, something that posed a problem for the congresswoman. Politicians both inside her own party and out claimed that the tweet was potentially anti-semitic, hinting that Jewish money was having an outsized influence on US democracy. A trope that’s precisely within the definition as laid out by the International Holocaust Remembrance Alliance. Critics pointed the fact that the tweet ignored the myriad of reasons behind US support of Israel, such as geopolitical concerns in the region, and reduced them to money alone. House Speaker Nancy Pelosi was among those to condemn the statement and demanded an apology from her Democratic colleague. The apology came from Omar but it was one which also asserted her right to criticise the influence of lobby groups in Washington. “Anti-Semitism is real and I am grateful for Jewish allies and colleagues who are educating me on the painful history of anti-Semitic tropes,” she said in her apology, before later reaffirming what she called “the problematic role of lobbyists in our politics”. It was that latter point which garnered Omar support among left-leaning activists and commentators. The role of the American Israel Public Affairs Committee, or Aipac, has long been a matter of debate in US politics. The lobby group has the stated aim of promoting Israel’s interests to US lawmakers and among other things brings new congresspeople on a sponsored trip to the country. In a follow up tweet to the one that caused controversy, Omar named the organisation as being particularly influential in Washington. Several writers and supporters have defended Omar for naming the organisation, stating that criticism of its lobbying should not be equated to anti-semitism. “We need to be able to examine the money and influence in politics that every special-interest group, including pro-Israel lobbying groups such as Aipac, wields,” Alex Kotch wrote in The Guardian. What’s also noteworthy about the controversy is not the tweet alone but that it coincided with a genuine political debate about the boycott movement in the US. Similar to the ongoing debate in Ireland over the Occupied Territories Bill and the push to boycott some Israeli goods, Omar and Tlaib support the same campaign in the US. Known there as the Boycott, Divestment and Sanctions (BDS) movement. When congress met for the first time after the recent midterms, the first bill passed by the Republican-led US Senate was one which attacked the BDS movement. It forced Omar and Tlaib to come out against the legislation, putting them in opposition with the Democratic party leadership, which opposes boycotting. The subsequent controversy over the tweet has led to further concerns that genuine public debate over official policy towards Israel is conflated with a debate around anti-semitism. Or that those who oppose Israeli policies engage in anti-semitic language when doing so. This has proven problematic for Jeremy Corbyn’s Labour with party members having been suspended, expelled or forced to resign as a result. Corbyn’s longtime Palestinian activism is popular among an enlarged Labour membership and there are certainly echoes of this among the leftward-moving Democrats. Former president Barack Obama and his testy relationship with Benjamin Netanyahu was one part of this, but changing electoral dynamics are another, as evidenced by the elections of Somali-American Omar and Palestinian-born Tlaib. But while Labour under Corbyn has warmly embraced protest-friendly politics, Democrats are more wary of doing the same. As seen when it dropped sponsorship from the hugely successful Women’s March movement because of its leadership’s links to the Nation of Islam. The controversy served as an example of the complexities inherent when a party expands its support-base and how it may become associated with groups it does not necessarily support or have influence over. The charge of guilt by association is one that has become a constant in UK politics in relation to Corbyn and has even made its way across the Atlantic. 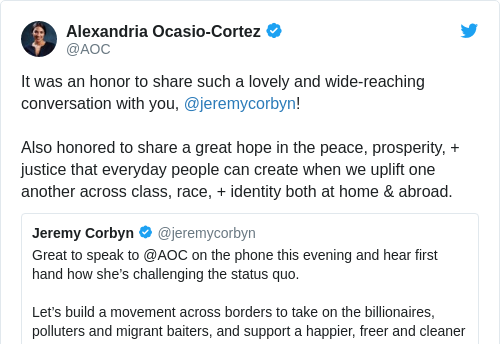 Much-talked about Congresswoman Alexandria Ocasio-Cortez spoke to Corbyn himself and both shared complimentary tweets, earning her criticism from corners as mainstream as CNN. The primary difference of course between Corbynite Labour and the new breed of Democrats is that the latter have not yet become the dominant voice in their party. They are unlikely to in the same way too, such is the US political system and the lack of political whips. But in a reinvigorated party that is looking towards building a coalition of support for 2020, they can’t afford to be ignored either. The challenge therefore is to make sure when their voice is heard the language they use is appropriate, and not open to being dismissed as bigotry.